Maruti Suzuki India Limited is the largest passenger car maker in the country. It has a number of vehicles in their fleet and is famous for their reasonable price range and reliable engines. Among the models available, Maurti Omni is their spacious multi purpose vehicle. It was first launched way back in the year 1985 and since then it is doing impressive business for the company. The company is selling this vehicle in quite a few trim levels, out of which, Maruti Omni MPI Ambulance is the top end variant. It is equipped with a 0.8-litre petrol engine, which comes with a displacement capacity of 796cc. It has the ability to generate about 34.2bhp and 59Nm of maximum torque output. This engine is further coupled with a four speed manual transmission gear box. The fuel efficiency of this vehicle is quite decent and it can produce 14.7 Kmpl on the bigger roads and 10.7 Kmpl in the city traffic conditions. The overall dimensions are quite standard and it can accommodate five passengers with ease. The overall length of the vehicle measures 3370mm along with a decent height of 1640mm. The total width of the vehicle is 1410mm, which also includes external rear view mirrors. The large wheelbase is 1840mm that ensures a spacious cabin inside and it has a decent ground clearance of 165mm. This MPV comes with sliding doors and body graphics, which gives it a decent appearance. To begin with the frontage, it is designed with a sleek radiator grille, which is embossed with a prominent company logo in the center. This grille is surrounded with a radiant headlight cluster, which is incorporated with clear lens lamps and a turn indicator. The black colored bumper is fitted with bright reflectors and a license plate that is affixed in the center. The large windscreen is made of laminated glass and is integrated with a pair of intermittent wipers. The side profile has sliding doors along with stylish decals . The door handles and outside rear view mirrors are painted in black color. The neatly carved wheel arches comes with mud flaps and have been fitted with a sturdy set of 12 inch steel wheels. These steel rims are further covered with radial tyres of size 145 R12 LT 6PR that ensures a superior road grip. The company has also given it a full size spare wheel, which is affixed in the boot compartment along with the tools require to change a flat tyre. The rear end gets a big tail gate along with a large wind screen and it also has company badging on it. Apart from these, it has a bright tail lamp cluster, bumper with reflectors and a high mounted stop lamp as well. The company is offering this variant in a few vibrant exterior paint options for the buyers to choose from. These include Pearl Blue Blaze with metallic finish, Silky Silver, Fantasy Black and a Superior White finish option as well. The company has done up the interiors of this Maruti Omni MPI Ambulance trim quite elegantly and incorporated it with a few utility based aspects. The seating arrangement is very comfortable and it has ample leg space for a minimum of five passengers. The seats are covered with two tone premium fabric upholstery. The driver seat are reclining and adjustable in accordance to the driver and all seats are integrated with adjustable head restraints. The list of some utility based aspects included in this trim are internal rear view mirror, a large glove compartment with lock to keep some small things at hand, front seat back pockets, cup holders in center console, front and rear assist grips, floor carpets that add to the elegance of the interiors, a steering lock and so on. The smooth dashboard is equipped with a three spoke steering wheel and a regular instrument cluster. This variant is fitted with a 0.8-litre, 4-stroke petrol engine, which is integrated with a water cooled system. This engine comes with a displacement capacity of 796cc and has 3-cylinders that has 6-valves in it. It is coupled with a four speed manual transmission gear box, which transmits the engine power to its front wheels. It has the capacity to attain a maximum speed of 120 Kmph, while it can cross the speed barrier of 100 Kmph in close to 20 seconds. This power plant can churn out a peak power output of 34.2bhp at 5000rpm along with 59Nm of maximum torque at 2500rpm, which is decent enough. The car manufacturer has given this utility vehicle a proficient braking and suspension mechanism, which keeps it well balanced at all times . The front axle is assembled with a McPherson strut, while the rear axle is equipped with a leaf spring type of mechanism. The rear wheels are equipped with a set of drum brakes, while front wheels get disc brakes with boosters. The company has blessed it with a recirculating ball type of manual steering system, which supports a minimum turning radius of 4.1 meters. 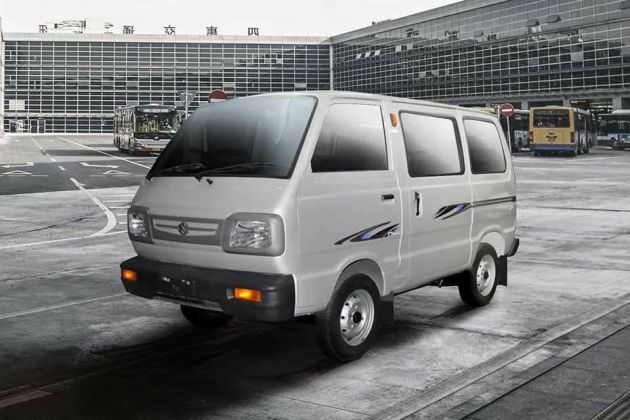 The list includes well cushioned seats with reclining and adjustment function, sun visor for driver as well front co-passengers, sliding windows for the rear seat occupants , internal rear view mirror and many other such aspects. It has an illuminated instrument cluster with a tachometer and a few other functions. Apart from these, the company has given this variant front seat pockets to keep a few smaller things, a recirculating ball steering wheel, which makes the handling of this vehicle simpler, dashboard with cup holders and so on. The company has fitted this Maruti Omni MPI Ambulance trim with some very essential and crucial safety aspects. The list comprises of rear doors with child locking system, adjustable seats for convenience of the driver, adjustable rear headrests and rear windscreen with demister. In addition to these, it also has an engine immobilizer to protect this utility vehicle from any unauthorized entry, 3-point seat belts for all occupants, front windscreen with a pair of 2-speed wiper, a high mounted stop lamp and clear lens headlamps. 1. Absence of power steering is a big minus. 2. Engine performance can be better. మారుతి ఓమ్ని 4 వేర్వేరు రంగులలో అందుబాటులో ఉంది - Fantasy Black, Metallic silky silver, Metallic Pearl Blue Blaze, Superior white. Maruti Omni is good for family, good mileage and super handling. Maruti Omni is a favorite car of my family and mine too, it is a big car with good space which is comfortable for my family.